Four critical care practitioners from the UF College of Pharmacy had their research published in the Annals of Pharmacotherapy in November. The article titled, “Recent Updates in the Pharmacological Management of Sepsis and Septic Shock: A Systematic Review Focused on Fluid Resuscitation, Vasopressors, and Corticosteroids,” shows that recent developments in the pharmacological management of sepsis are encouraging, but that clinicians must utilize patient-specific factors to guide therapy. Clinical assistant professors John Allen, Pharm.D., and Bethany Shoulders, Pharm.D., and clinical associate professors Stacy Voils, Pharm.D., and Carinda Feild, Pharm.D., had their septic shock research published in the Annals of Pharmacotherapy. 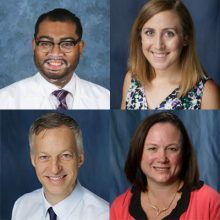 All four critical care practitioners are from the department of pharmacotherapy and translational research, including clinical assistant professors John Allen, Pharm.D., and Bethany Shoulders, Pharm.D., as well as clinical associate professors Stacy Voils, Pharm.D., and Carinda Feild, Pharm.D. Septic shock is a medical emergency that occurs when the body has an extreme response to an infection and is associated with high morbidity and mortality. As the body fends off an infection in the skin, lungs urinary tract or elsewhere, it can lead to dangerously low blood pressure and abnormalities in cellular metabolism. As researchers and clinicians from various health care disciplines continue to explore new ways to improve understanding and management strategies, pharmacological management has evolved. The four pharmacy researchers used 14 latest published studies to explore pharmacological management. Allen, the principal investigator, said future research on these topics should look to address limitations of the current studies and identify patient-specific factors that may guide therapy, such as defining subsets of septic patients who are most likely to benefit from these therapies.